Have you talked to your CF Team about your sexual and reproductive health? I often say that there is no modesty in medicine. I mean, we routinely talk with medical professionals who are used to gross anatomy. But I realized I was wrong when I broached sexual and reproductive health (SRH) issues with my CF physician. After I attended the CFF MiniCon on SRH, I was so energized by the honest discussions that I had handwritten notes to share at clinic the next day. After giving an overview of the event, I listed items clinics should be talking about and offered my notes for use as a reference. Continue reading Have you talked to your CF Team about your sexual and reproductive health? In his latest podcast, Jerry Cahill sat down with Ben James, a 19-year-old college student who was diagnosed with cystic fibrosis at 4 years old. Originally from Chester, VA, Ben now attends Mount Vernon Nazarene University in Ohio where he studies pre-medicine. When he isn’t focusing on school subjects like anatomy and physiology, Ben likes to play basketball and soccer, and also likes to run long distance. 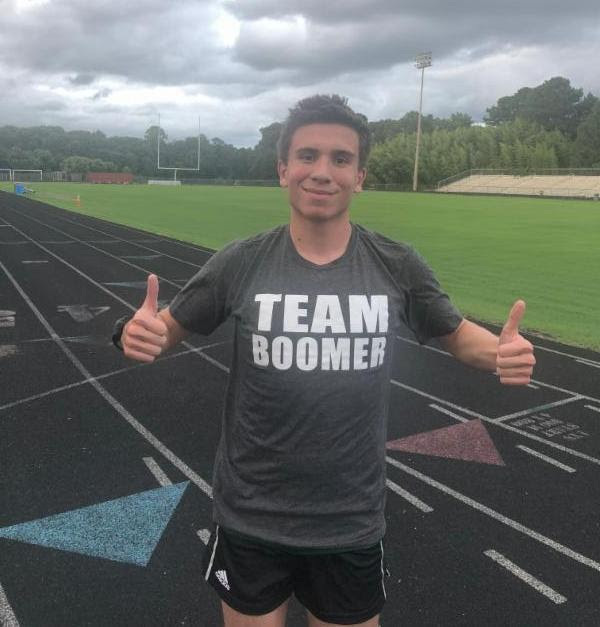 Ben loves the challenge of running long distance for a number of reasons, including building character, facing challenges as an individual, and learning discipline, which helps with his overall medical compliance. This podcast was made possible through an unrestricted educational grant from Genentech to the Boomer Esiason Foundation. The next year is going to be a big one. I am writing against the clock to meet deadlines for my dissertation, sending out a book manuscript to a publisher, writing my first book review for an academic journal, presenting for the first time at a national conference…and all that on top of my first semester, in the Spring, of teaching undergraduates. Suffice it to say I’ll be busy. I wouldn’t have it any other way, though. Finally—at last—I feel like less of a perpetual student (I’ve been in higher education almost 12 years) and more like someone actually enjoying the first fruits of his career. That’s why I’m grateful to be one of the recipients of this year’s Lauren Melissa Kelley Scholarship; graduate school isn’t cheap, and so these funds will be of immediate help to me. For example, I travel to one or two academic conferences a year, and often I cannot get the university to recompense me for all of the travel. That means that some of it comes out of pocket for me. The LMK scholarship will help me recoup these costs and make it more likely that I will pursue these opportunities to engage in the academic community and share my work. Another way the LMK scholarship will make a big difference is in allowing me to continue my language education. Now that I no longer am in coursework, the simplest way for me to continue improving my languages (German and ancient Greek are the ones I’m currently working on) is to have a private tutor who can work around my dissertation-writing schedule. These lessons are not cheap, but they significantly and rapidly help me improve my language skills, which in turn allows me to access more material for my scholarship and makes it possible for me to become a truly international academic who can engage with people from various parts of the world. It would be a welcome financial relief to know I have funds to continue my education now that I have finished formal coursework and am expected to be writing a book! In short, this is a critical period in my career of transition from student to scholar, and the LMK scholarship will facilitate this ctransition with greater ease. In many ways the academic life is well tailored for someone negotiating the scheduled and regimented life cystic fibrosis demands. And I am happy to say that I’ve encountered nothing but support and encouragement from my faculty and colleagues when it comes to managing both my illness and my career. But it’s also a support in my work and life to know that so many others with CF are living their lives to the fullest, and that behind them there is a huge community of people who care about people with CF and work incredibly hard, often behind the scenes, to make a rich life possible for them. CFRoundtable and the LMK Scholarship are outposts of this amazing community of doctors, researchers, social workers, advocates, speakers, families, and friends. I relish the opportunity to be on the receiving end of their care, and I cannot wait to pay it forward in whatever way I can. Being in a committed, loving, long-term relationship is a distinctly intimate experience. It is the most intimate experience of humanhood many would argue. To see a person walking by and say to them, “Hey, you’re fairly OK-looking. Would you like to hold hands for forever and accrue debt until we die?” is to truly know companionship. That, and watching each other poop. Chronic illness makes dating a thoroughly more vulnerable experience, and not just for the patient. You see, sickness affects everyone involved. It accelerates everything. Sickness makes daily life complicated (e.g. planning dates that aren’t physically taxing or one partner relying more on the other for help with everyday chores) and the future even less promising than it usually is. When you or your partner has a condition like cystic fibrosis, the bleak reality of your situation is sorely evident. It’s inescapable. One of you will die much sooner than the other. And with that intense reality flashing its lights 24/7, it can be tempting to hold things in. I don’t speak for all people with CF in writing the following list — but by sharing what I’ve withheld in past romantic relationships, I hope to make you laugh, open your eyes, and help you become a better partner to the person whose hand you like to hold. Enjoy. 1. They’ve been wetting your bed for a while. Have you ever rolled over in the middle of the night to feel a damp spot on the mattress? Has your girlfriend been known to spontaneously wash your sheets and comforter out of the goodness of her heart? Yeah, sorry to break it to you, it’s not because she’s an angel. It’s because she has coughing-induced, premature incontinence, and she doesn’t want you to know. 2. Their antibiotics give them diarrhea. It just happens, OK! We don’t ask for this! Antibiotics have one mission: to kill. This includes good gut bacteria, which unfortunately messes up our tummies. Make your partner’s day by surprising them with a bottle of probiotic-rich kombucha to get things back on track. 3. They’d prefer if you looked away during their cough attacks. Coughing ain’t cute. Yes, yes, I know you love them, but try to put yourself in your partner’s shoes. If you were red in the face, foaming at the mouth, hunched over like the Notre Dame character, and spewing phlegm like a swampy sprinkler, would you want the love of your life to gaze longingly upon you? Probably not. Give ’em space. 4. They wish you visited them in the hospital more. They just feel too guilty to say it out loud. It is unspeakably lonely to sit in a small room and face the same wall every day. Please, even if they insist they’re fine, be there for them. Stop by. Make the time. If you can’t do that, text, call, or video chat. While 24 hours pass by in a snap in the outside world, in the hospital, the hours drag like you wouldn’t believe. 5. It makes them really happy when you randomly flex your CF knowledge. Showing your partner that you care about them enough to not only learn about their disease but about how it’s treated is an instant way to grow closer. For many of us, the only people we have to confide in about this part of our lives is our medical team, our family, and occasionally other CFers (but only online). Take the time to learn what’s what — get the medication names right, make yourself an ally, and demonstrate that the two of you are teammates in this fight. 6. Explaining what’s “wrong” with them to other people makes their life so much easier. With this one, I want to repeat my disclaimer: I am speaking for myself, and every person with CF is different. Please talk to your partner before taking this advice. With that said, I have always found it to be an incredible relief when my partner discreetly says, “She has something called CF, so she coughs a lot. It’s normal. So anyway … ” and then changes the subject when I have a cough attack around people who don’t know me. Explaining myself is something I’ve had to do my entire life, so having someone else do it for me is a treat I savor every time. 7. They don’t feel worthy of your love, and they feel guilty about loving you. I hope this one isn’t true for you guys. In my case, it is, and I suspect it’ll be a lifelong battle. Having an incurable illness is a heavy burden to bear, but when you’re born with it, there’s no other option. Putting it on another person, though, that’s different. That isoptional. And it can feel impossible to justify exposing the person whose hand you like holding to that level of lifelong pain. This post originally appeared on CF News Today.